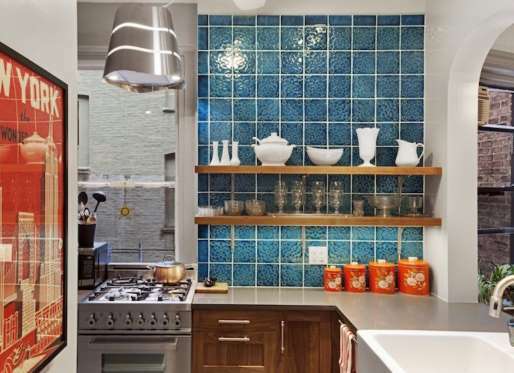 As living spaces shrink, homeowners are devising savvy new ways to stow their stuff. Double-duty kitchen wall space will do the trick, say the pros at Bryan Bell Construction in Mountain Home, Arkansas. Look for pantries and cupboards being integrated directly into the wall for easy-reach convenience, and more open shelving to display collections. Indoors and out, smart lighting controls are a brilliant idea whose time has come. These automatic systems are catching on because they save energy (and money), plus they can be tailored to suit your family’s lifestyle—turning on at the times of day and year when you need them, shutting off when you don’t. Goodbye, glossy! Matte will be major in 2018, especially in the kitchen. “The next new trend in surfaces are unique textures such as linen granite and hammered basalt tiles—both in a modern matte finish,” says Sarah Stacey of Sarah Stacey Interior Design in Austin, Texas. Matte appliances will also come on strong next year. Interestingly, as matte moves into the kitchen, metallic and iridescent fixtures are finding their way into other rooms. Designers are in excited agreement about metal anchor pieces like coffee and side tables, as well as the use of sparkly materials for pillows, lampshades, and drapes. Shine on! Break out the sunscreen! 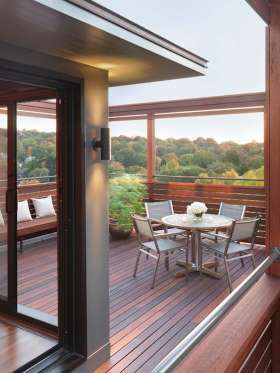 In the coming year homeowners will be expanding their living space to the great outdoors. More folks plan to put in pools, and now the patio is literally moving up: The roof decks that marry the indoor and outdoor spaces, like this design by Flavin Architects, were once considered the sole province of apartment buildings, but will become increasingly popular on private residences in 2018. Our increasingly techy world is creating a craving for warm, rustic, real elements in the home—and that means wood! Not just for flooring but such unexpected surfaces as walls and ceilings, predicts Philadelphia interior designer Larina Kase. “Utilitarian pieces such as lamps and pots for plants are also great places for natural wood,” she adds. Also look for “cerused” wood—a centuries-old technique that’s making a comeback to bring out wood’s unique grain. Geometric patterns will pop up all over the place. “We’ll see geometrics in everything from tile on backsplashes to wallpaper to wall art,” says Kase. 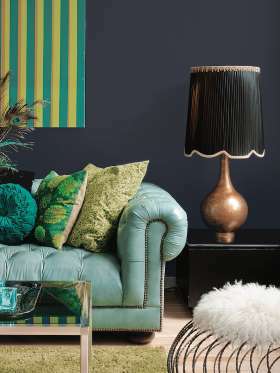 You can go big, covering an entire room with the bold look, or use as subtle yet striking accents here and there. Saving money and energy is a priority every year, but more people will be installing tankless water heaters in 2018. These devices provide only “as-needed” hot water, at a rate of about two to five gallons per minute. They’re available in both gas and electric models, and because they’re smaller than traditional tanks, they’re also great if you’re short on space. Extended families living under one roof are becoming more common—and that may now mean the addition of an in-law suite (complete with small kitchen, full bath, and bedroom). To keep elder loved ones safe and comfortable, these suites include slip-proof flooring, fewer stairs, and wider doorways to accommodate wheelchairs. Note: These upgrades are great for those who wish to age in place, too. Baked earth is back in a big way, but in dramatic colors and intricate patterns—not so much the traditional dark red tiles everyone is familiar with. “Look to companies like Tabarka to see new ways to use this material,” Sarah Stacey suggests. Once considered a zone to dump dirty shoes, the mudroom is trending up now, note the pros at the Schuylkill County, Pennsylvania-based plumbing, HVAC, and remodeling firm Losch. Modern mudrooms have shelving, cubbies, racks, and even locker-style units for outerwear, book bags and other items that might instead clutter up a kitchen. What’s more, keeping stuff out of sight, in drawers and behind cabinet doors will make the mudroom so attractive, we might have to invent a nicer name for it! For those who love stark simplicity, basic black and white are never out of style. But in 2018, the trend will lean toward white flooring and black (or, okay, dark gray, eggplant, and indigo) walls.